Genesis is a popular WordPress multi-purpose theme framework created by StudioPress. Genesis is highly reputable for it’s clean code and seo benefits. So, let us discuss in this article about the pros and cons of using Genesis. First, let us be positive and see what are the pros of using Genesis. Genesis has many SEO benefits in-build, in fact most of the popular bloggers use genesis for this very reason. Now, coming to the point what’s so special of using genesis in terms of seo? Genesis gives you a clean code which helps you in ranking higher in search engines. Genesis loads faster and optimizes your content effectively. are mobile responsive. But, still it is a major known fact that responsive websites are given an upper hand in search results. The second major reason on why genesis would be a good choice is it’s plugin compatibility. Since, genesis has been there for a long time almost all plugins test their functionality with genesis before releasing it to the public. Hence, it is very hard to come across a plugin which is not compatible with genesis. There are also many child themes being developed for genesis. So, there are ample options for website design when we choose genesis. But, we should also keep in mind that child themes cannot be better than core theme. Child themes might also prevent functionality some features of genesis core theme. Genesis offers it’s users with 6 different types of layouts and 3 different templates. This is very useful in differentiating content and also improves the readability. Different layout options gives the user a free hand to decide the website’s appearance. Content/Sidebar: This is a 2 column layout where the content is on the left and sidebar on the right. Sidebar/Content: This is again a 2 column layout where the content comes on the right and the sidebar is pushed to the left. Content/Sidebar/Sidebar: This is a 3-column layout where the content is to the left of the 2 sidebars. Sidebar/Sidebar/Content: In this layout option the content is pushed to the right of the 2 sidebars. Sidebar/Content/Sidebar: This is the most used layout option where the content is displayed in the middle of both the sidebars. Full Width Content: As the name suggests here there is no sidebar and only content is displayed. You can learn more about these layout options by viewing their Genesis Demo.This theme also offers it’s users with 3 different templates namely Archive Page Template, Blog Page Template and Landing Page Template. Once you start using genesis you would fall in love with the themes design. The design of this theme is very simple and elegant. This theme is best suited for blogs and magazine type of websites. The design is highly flexible and is majorly focused on user-friendliness. The fonts used is very easy to read and improves the website’s overall appearance. There is no unnecessary sliders or carousel effects which slows down the website loading speed. The design gives importance to basic usage and easy navigation within the website. Any theme which does not offer customizing features is not worth the time. But genesis scores in this area and gives it’s users with varied website customizing ability. Featured Content Widgets: This widget helps to highlight important content. Theme Customizer: This is a highly effective feature which helps the user to change the colors, settings and content. This can also be used to see the changes made in real-time. Customizable Header: Users can be able to upload their own logo and tag line using this option. Genesis has an excellent support network through which it is easy to solve any issue arising out of the theme. Since genesis is a highly popular theme there are also many freelancers who offer support specifically for genesis. It is very easy to find a freelancer to solve your issue through major freelancing websites like Fiverr or freelancer. This doesn’t mean that their official support is poor. Genesis buyers get unlimited support and updates. Users would also be given access to detailed tutorials on how to use genesis effectively. There is no light without darkness like that using genesis also comes with certain cons. This is a major reason which can be said to be a negative point for using Genesis. Since there are many users all around the web, your website falls one among the crowd. Using Genesis for blogs has been very common and there is no uniqueness between different websites. Although, the only way around this issue is heavy customization. But, still as said earlier customization might affect the core features of the theme. 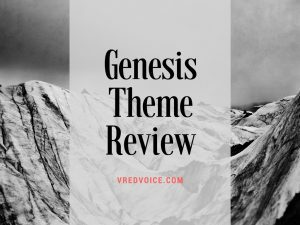 Genesis is still leader in it’s segment, but there are also other better themes like Divi or Avada. Which gives more number of features compared to genesis. Genesis could be one of the best choice for any type of website but there are still other better options to consider. It would be the users choice on how he would like to use the theme. If the major purpose of the theme is blogging or development Genesis is a good choice. But if the website is going to be business related then there are many better options to consider. Also, it is highly recommended to use this theme for development purposes. We hope we have covered all the points related to genesis. If you have any doubt or queries let us know in the comment section below.